Emotional investing isn't so much about using emotions to choose investments. 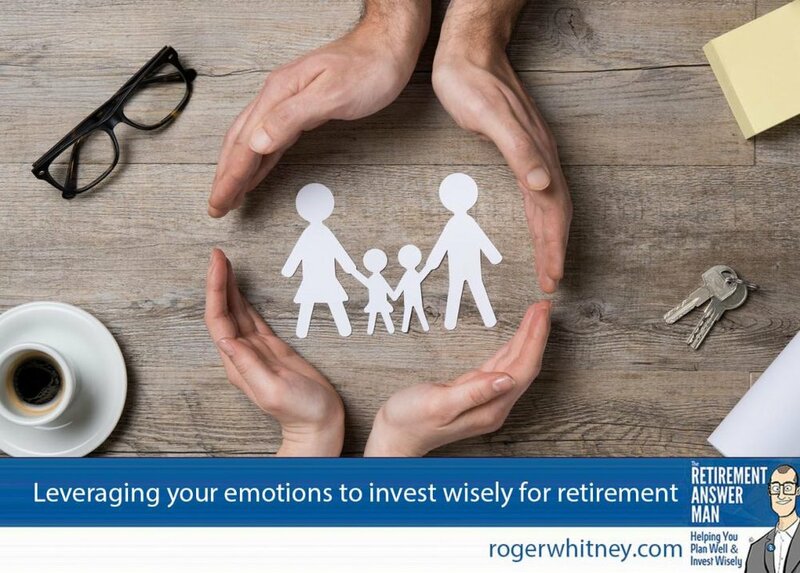 It should be about choosing which emotions to pay attention to for your retirement savings. Close up of female and male hands protecting a paper chain family. Top view of two hands form a circle around white paper chain family on wooden table. Family care, insurance and helping hand concept. You’re going to hate me for this: Emotions and retirement investment shouldn’t mix. I know, that sounds opposite to the title I slapped up there. Let me add a caveat: emotions caused by an event or some bad news shouldn’t influence your investment decisions before retirement. The problem is, emotions often get in the way of good financial decisions. I had Dr. Daniel Crosby on the podcast back in July. He’s a psychologist, fellow financial advisor, and the author of several books. Dr. Crosby told me that emotional investing is like hitting in blackjack when you’re sitting on a 19. Even if you draw a two and win tons of money, you’re still a putz for doing it. The CNN Money Fear and Greed Index points out two different emotions that often drive investors. Currently, greed is driving a lot of investment decisions and fear is largely taking a backseat. But these are both short-term emotions. If stocks suddenly tumbled across the board, you can bet fear would take over that index. Dr. Crosby pointed out to me that people have the psychological tendency to project the short-term past into the near future. Because of that tendency, when our short-term emotions get the better of us, we tend to overstay our welcome in either greed or fear. Our investments suffer for it. As a financial advisor, my job is to make sure you don’t emotionally react to market forces—you’re usually in it for the long haul. This is the reason I use one of my partners in business as my financial advisor. I have fears and greeds just like everyone else, and I need someone to center my emotions for my investments, especially when I want to react out of fear or greed to temporary market conditions. So yeah. Fear and greed? Not good emotions to react to when investing for retirement. But Dr. Crosby did have some good advice about the emotions you should heed. But here’s where I come back to the promise I made in the title. One psychological study looked at savers who were at a subsistence level. Researchers were trying to find a way to hack into these people’s minds to get them to set aside more money for a rainy day. But when researchers primed participants to save money by showing them a picture of their family, the research subjects managed to scrape aside 200 percent more than in their control state. The lesson? Pay attention to what matters most when investing for retirement. What matters to you while saving for retirement? Throughout your investing life, you’ve probably been guided to believe you need to maximize your dollars – move upward and onward with your investments. That every dollar not invested isn’t being maximized. But that’s a process that’s inherently risky. If you’re young, you can and probably should live by this maximization strategy. You’ve got time to recover from market corrections. Yet at some point, maximization no longer serves your long-term best interests. So on a process level—not using greed, fear, or bias as the basis for your shifts—you trade wealth maximization for life maximization. For the most part, you want to disconnect from temporary emotions and tap into the bigger emotional picture of the stage of life you’re in. And in the meantime, surround yourself with wise people who can offer counterbalance that’s disconnected from your knee-jerk emotions. That’ll be the person who looks at what’s best for you and your long-term emotions. Do you have a dispassionate process set up for your retirement investments? Or do you allow the wrong emotions to muck up your system? #160 - Certainty Is Absurd: How To Deal With Uncertainty.